These parts will serve as demonstration and proof of concept for the modularization of some of the Scherk-Collins toroidal structures with the ultimate goal of casting them in bronze or creating an injection mold. They will be used in classes on geometrical modeling and on the math of minimal surfaces, and they serve as a small scale model for artists, e.g., Brent Collins, who is creating similar sculptures in wood. 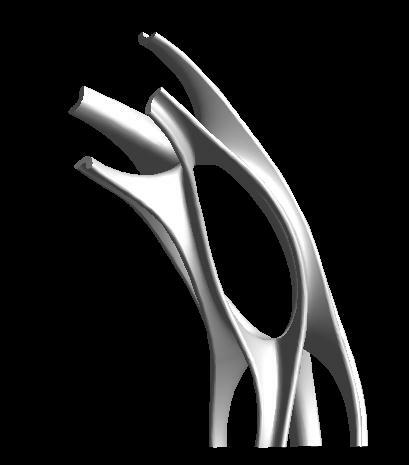 This is part of a research program sponsored by NSF to streamline the process of rapid prototyping of free form parts, by defining a clean separation and interface between designers and fabricators. This is one part of a bigger arch. The scale or strength of these models is not critical; they can be scaled so as to fit optimally a particular process or fabrication machine. Minimal build height should be achieved if the part is rotated 90 degrees around the X-axis. For a first test piece one should use a 50% scale, -- mapping each unit to 0.5 inches. In these .STL files, vertices have not been merged (yet); so they require software that does not get upset when shared vertices appear separated by one unit in the last digit due to rounding errors. The FILE.stl.gz file can be uncompressed with gunzip.